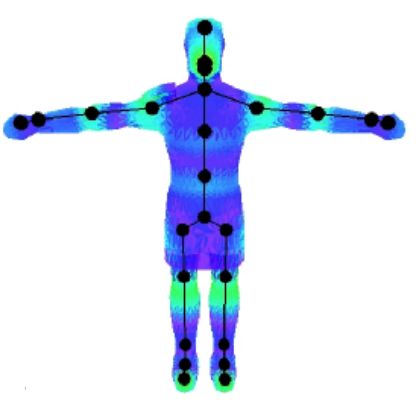 Real-time animation of human-like characters has been an active research area in computer graphics. Nowadays, more and more applications need to render various realistic scenes with human motion in crowds for interactive virtual environments. Animation and level of detail are well explored fields but little has been done to generate level of detail automatically for dynamic articulated meshes. Our approach is based on the combination of three interesting layers for run-time level of detail in character crowd animation: the skeleton, the mesh and the motion. 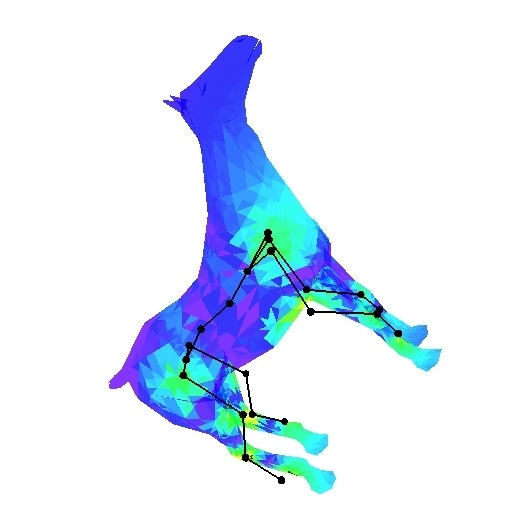 We build a Multiresolution Skeletal Graph to simplify the skeleton topology progressively. In contrast with previous works, we use a Dual-Graph Based Simplification for articulated meshes, where the triangle decimation is driven by triangle compactness, to build a dynamic, continuous, progressive and selective mesh level of detail. We also present Power Skinning to ensure the stability of Linear Smooth Skinning, during the simplification, with an efficient multi-weight update rule. Interaction and Physical Simulation (VRIPHYS'08), Eurographics, November 2008, Grenoble, France. publisher	= "The Eurographics Association"